A major climate change lawsuit is on hold. Again. Children are suing the government for contributing to climate change, but the Trump administration wants to stop the case. ShareA major climate change lawsuit is on hold. Again. 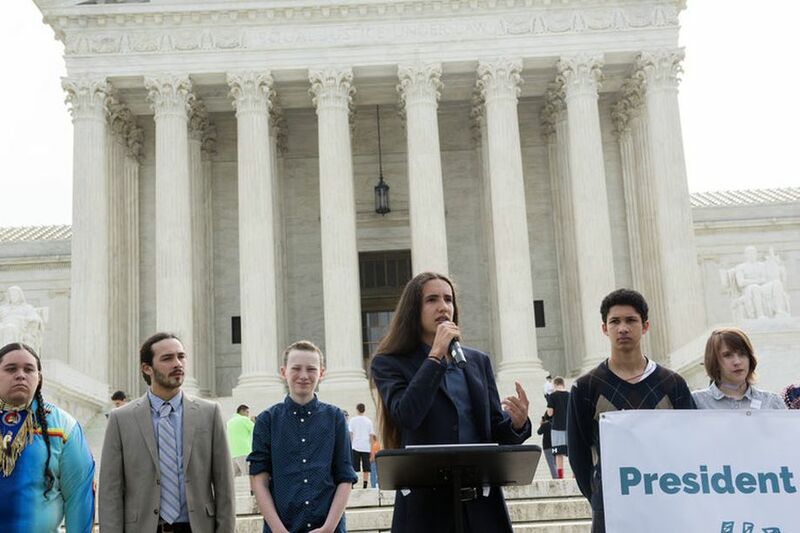 Earth Guardians Youth Director Xiuhtezcatl Martinez, one of the plaintiffs in the Juliana v. US climate lawsuit, speaks outside the US Supreme Court in 2017. Update, November 8: The Ninth Circuit Court of Appeals granted part of the Trump administration’s motion for a temporary stay of the Juliana v. US lawsuit. Trial preparations are still going ahead, but the plaintiffs have 15 days to file a response. Read more about the background of the case and the stakes below. In a surprise decision late Friday, the Supreme Court cleared the way for Juliana v. US, a major lawsuit filed by young people against the US government for failing to limit the effects of climate change. It’s not yet clear if the case will go to trial, but attorneys on both sides will meet on Thursday with Oregon District Court Judge Ann Aiken to decide if and when the trial will begin. The case includes 21 plaintiffs between the ages of 11 and 22, who began testing the idea that a safe climate is a civil right when the suit was first filed in 2015. It argues that the US government pursued policies that harmed the climate, thereby robbing the children of a “climate system capable of sustaining human life.” As redress, they want the government to take action to fight climate change. A lower court ruled earlier this year the case could go to trial, and that trial was expected begin at the United States District Court in Oregon on Monday, October 29. But then late last month, Supreme Court Chief Justice John Roberts issued a temporary stay of the case to consider a request from the Justice Department for a stay to halt the case. The Supreme Court’s temporary stay sent the plaintiffs scrambling to put together a brief in time to keep the case moving forward on schedule. On Friday, the court denied the government’s request for a stay, though Justices Clarence Thomas and Neil Gorsuch would have granted the application, according to the court order. The Supreme Court also suggested that a federal appeals court should consider appeals on other grounds before the case heads to trial in district court. The Justice Department this week filed even more motions to stop the trial and have the case dismissed. “The federal government, by engaging in filing all these motions and petitions, is very, very scared of the evidence we’re going to put on at the trial,” Philip Gregory, co-lead counsel for the plaintiffs, told Vox. Several legal analysts told Vox that the Supreme Court’s temporary stay of a case in a lower court was unusual, but the action signaled that the high court is very interested in the issues at play and that the justices expect the case could have significant ripple effects. Now the federal government is arguing that there is no constitutional right to an environment free of climate change and that the children don’t have standing to make such a claim. But both sides agree that the case is not a question of the science. “This is not an environmental case, it’s a civil rights case,” wrote Our Children’s Trust, the nonprofit that is backing the lawsuit, in a press release. The US government, the defendant, has argued that the case has no basis in the law. But in its filings, the government cited the harms from costs of litigation as the reason it was seeking a stay, essentially arguing that it is a waste of time and money to litigate a claim that would likely be dismissed. For climate change activists, the courtroom is one of the few remaining options for enacting policies to limit greenhouse gases, as the White House scarcely acknowledges climate change and Congress remains deadlocked.